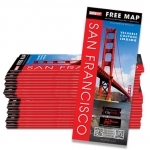 Map San Francisco, MapWharf and Chaperon Guidebooks are great additions for your group or meeting. Perfect publications to included in welcome packets or registration kits. The maps and guidebooks are free. We do charge for the USPS shipping cost. >Bulk orders are available for free delivery to our established distribution locations in Northern California. If you would like to distribute free maps or Chaperon at your Hotel, Info Center, Restaurant, School, Airport or high visitor traffic location contact us. Will you be visiting San Francisco? Our Free Maps are very popular with travelers. Perfect for planning your trip while here. Pick up our Free Maps and Chaperon Guides at the SFO, OAK and SAN JOSE Airports, Your Hotel, Visitor Information Centers, Local Merchants and Green Street Racks throughout the City. Available throughout Northern California and at all major Bay Area airports. Look for MapWest Publications – MAPSF, MAPWHARF, and Chaperon The Multilingual Guide to San Francisco. The maps include points of interest, recommended activities, public transit, travel distances, airport info, street index and daily planners. The San Francisco street map includes detailed maps of Golden Gate Park, Fisherman’s Wharf, Union Square and Seven Northern California regions. 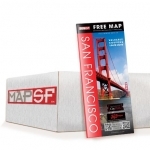 Most San Francisco, Oakland, Peninsula (Silicon Valley) Marin Hotels have our maps at the concierge or front desk. Look Green Street Racks throughout San Francisco with MAPSF and MAPWHARF. We do not mail individual map orders due to rising postage costs. Celebrating our 26th Year as the #1 Visitor Map and Visitor Guide Publication Company in San Francisco. 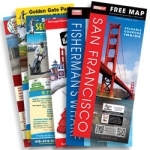 Map West, Inc. was established in 1992 and quickly became one of the largest publishers of Visitor Guides and Traveler Information in San Francisco. 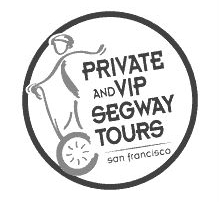 With a dedicated sales force and a talented in-house design staff we continue to publish informative and easy-to-use Visitor Guides for San Francisco and the Bay Area.